Cranberry Orange Bread: Fresh cranberries, paired with orange citrus in what can be called a bread or cake. A tender crumb filled with goodness and drizzled with a simple sugar glaze. A homemade treat that will be appreciated for all of the people you make food gifts at Christmas for! Looking for the perfect Food Gift at Christmas for those you care for. This Cranberry Orange bread will make you the most popular person in the neighborhood. It’s easy to make but still full of all of the flavors of the season. It works well for your next door neighbor, a co-worker or as an item to bring for your company potluck. The cranberry Orange bread is so light with a tender crumb, lots of my neighbors refer to it as a cranberry orange cake, or the Christmas Cake. 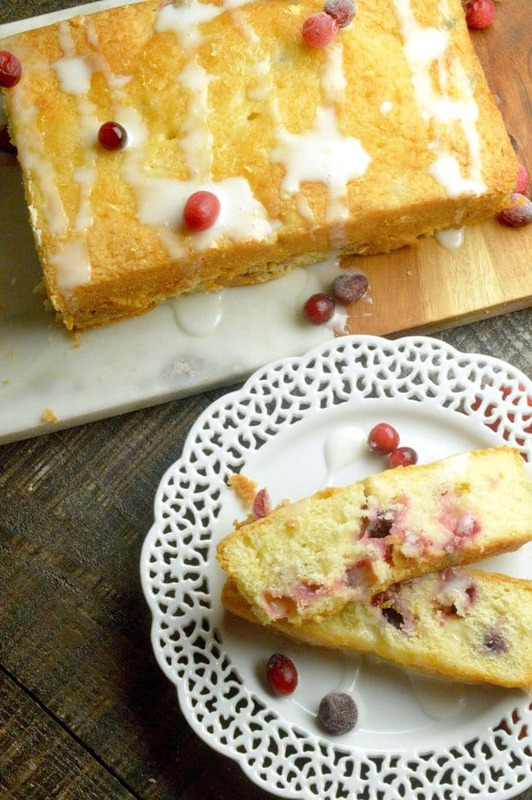 What is the trick to making Cranberry Orange Cake for baking gifts? 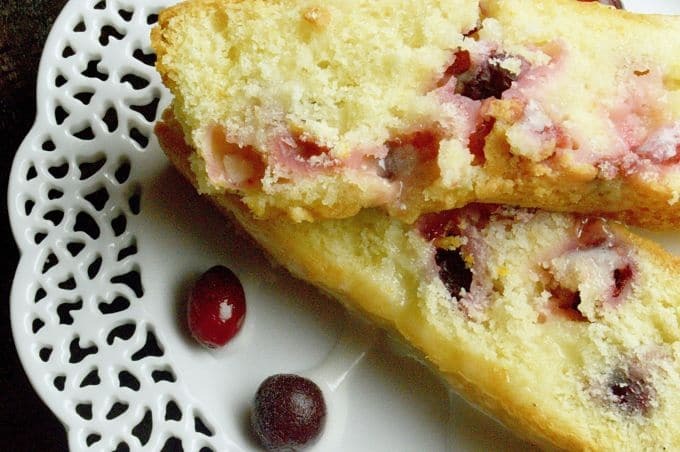 This Cranberry Orange Bread is super easy to make. I used a mixer to mix it up (like this Kitchen Aid Here) but you could also use a hand mixer or even just a spoon and some manual stirring. The trick for the bread/cake is to mix everything in one at a time and pay attention to the consistency and color changes to know when to go to the next step. Adding the eggs in one at a time to completely incorporate (see 2 and 3) The color lightens right away with the first egg, by the time you have added them all (diagram 3) the batter is much fluffier and lighter in color. You need to mix all of the dry ingredients together before adding them into the egg/sugar. Mixing the dry ingredients allows for even baking throughout the whole loaf. (second tip…. you can either use a sifter like this one here or you could use a mixing bowl, and a whisk to mix them all together. This recipe doesn’t require sifted ingredients for the lighter texture like some recipes do, the sifter is just to spread the ingredients evenly. I suggest using fresh cranberries in this recipe. You can sub dried cranberries, but the fresh cranberries make this more festive and much more flavorful in my opinion. Dried cranberries are a little sweeter due to the concentration in drying. The fresh cranberries in this Cranberry Orange Bread are tart and go well with the amount of orange juice and sugar in the recipe. Whether you used a hand mixer, regular mixer or a spatula up until this point, when stirring in the cranberries fold them in by hand. This will allow for more gentle handling of the the cranberries so the red juice doesn’t turn the whole bread/cake dough/batter pink! Finally pour the batter into prepared loaf pans. (see diagram 6) (To prepare the pans butter the bottom and sides, then put in some flour and coat all sides. This will make this Holiday food gift easy to come out of the pan for wrapping! If you are looking for other recipes to give as homemade food gifts or holiday treats you can also check out Fearless Dining for her Gluten free Cranberry Shortbread bars or my recipe for Blueberry Lemon Muffins Tropical Christmas cookies (They will make you wish you were on a tropical island and forget about the stress of the holidays I promise! ). If you have your heart set on another bread gift recipe this recipe for Pumpkin bread never disappoints (especially the cream cheese glaze…..) from Lisa’s Dinnertime Dishes! I almost forgot…. if you need a bread the just screams holidays…. this Eggnog Bread from A foodie Affair will make anyone get in the holiday spirit! PIN THIS TO YOUR HOLIDAY GIFT BOARD for when you are looking for ideas to give at Christmas! Also Follow me on Pinterest to get more ideas to have for making easy delicious meals and appetizers for any entertaining! Prepare 2 loaf pans by using butter to grease the bottom and sides of the pans. Then place a small scoop of flour in the pan and tilt the pan to cover all greased areas with flour. Dump remaining flour away. In a mixing bowl, cream butter sugar and orange zest together on high for 3-5 minutes. Then one at a time, add an egg to to the butter mixture. Mix for one minute before adding the second egg, then again one more minute before adding the last egg. Add vanilla and mix for one minute more. In a separate bowl sift together flour, baking powder, and salt until well combined. Turn the mixer onto low and and 1/3 of the flour mixture to butter/sugar mixture. Mix until combined Then add 1/3 of buttermilk and mix until combined. Repeat this step two more times until all flour and buttermilk has been incorporated. 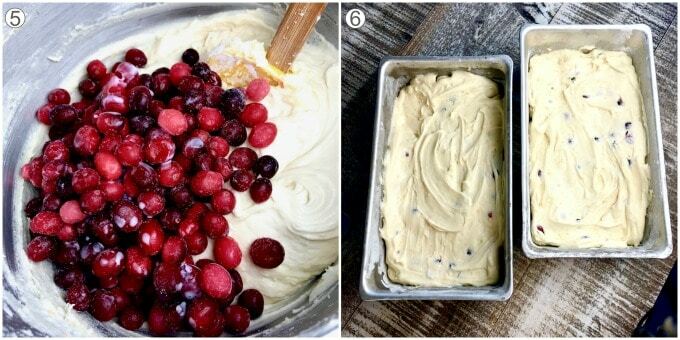 Add cranberries to dough and by hand using a spatula fold the cranberries in gently to not break the cranberries. Mix as little as possible to just get them even to avoid the batter turning pink from any juices. Bake at 350° for 55-60 minutes until a toothpick comes out clean when inserted to the center. Let loaves cool on a wire rack for 15 minutes before removing from the loaf pan. Then allow to completely cool for 30 minutes before pouring Orange glaze over the top. Once you have glazed the bread/cake allow to cool completely then wrap each loaf in cellophane and tie up with ribbon for giving as gifts. In a small bowl add all ingredients and mix until well combined. This is my kind of holiday bread/cake! I LOVE orange and cranberry together and can’t wait to try this recipe. This cake looks so moist, yuuuum!